After making a batch of these Blueberry Oat Bars for some friends and family over the Fourth of July, my family declared that this recipe is “blogworthy.” So while Rachel was busy putting together a post about Seven Healthy Berry Recipes, I felt the need to compensate with a not-so-healthy, eat-in-moderation, worth-every-calorie berry recipe. I got this Blueberry Oat Bar recipe from Tracy’s Culinary Adventures and pinned it knowing I would for sure use it in the future. Well, I was right. 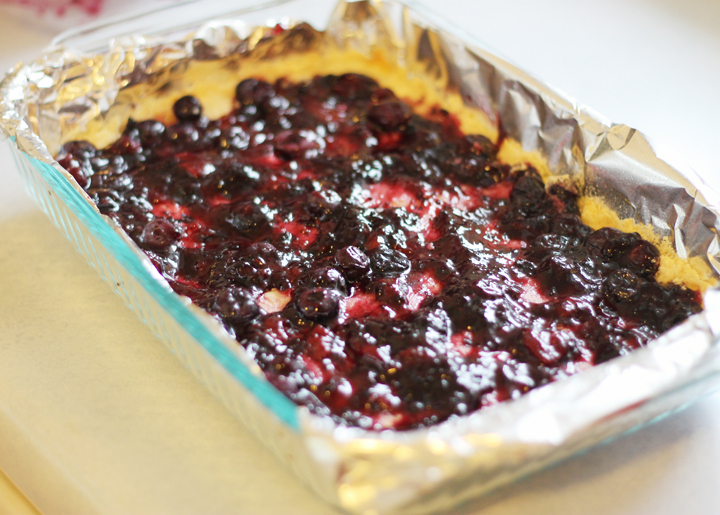 After blueberry picking with my kiddos, we had an abundance of berries to use up and this recipe was the first one I tried. I loved the simplicity of these bars. They have a buttery shortbread that cuts easily for sharing or even freezing. 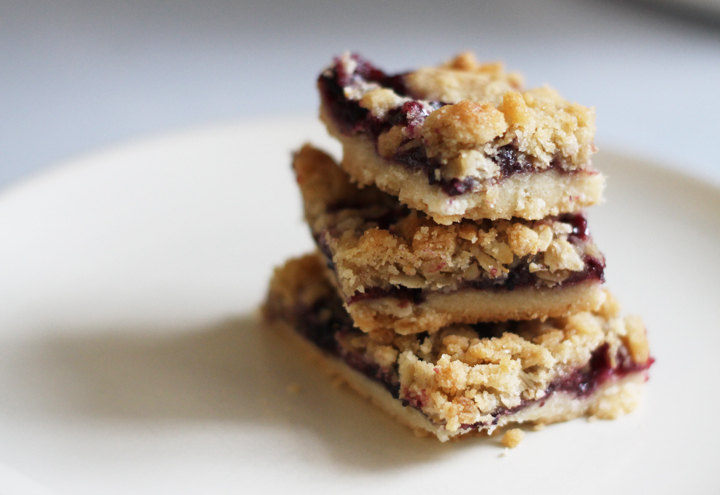 On top of the shortbread is a sweet, but not too sweet, blueberry filling topped with an oaty crumble topping. I also liked that they were easily portable and a great dessert to take to a gathering of friends. Want to make a batch? 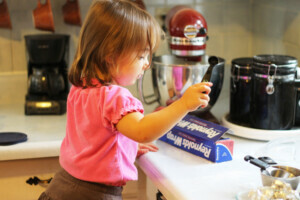 First step is to recruit a two-year old helper. Preheat oven to 375 F. Line a 13×9 baking pan with foil, leaving an overhang on opposite sides to use as “handles” to lift the bars out afterward. Spray the foil with nonstick cooking spray. 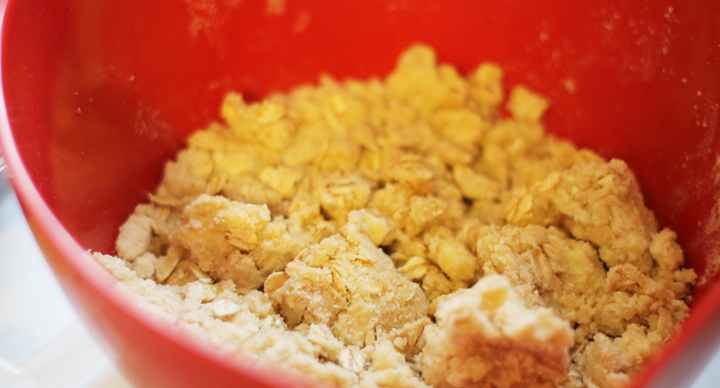 Add the flour, sugar, and salt to the bowl of a stand mixer. Mix briefly on low speed to combine. Cut the butter into small, 1/2-inch pieces and then, with the mixer on low, add 16 tablespoons (2 sticks) of the butter, one piece at a time. When you’ve finished adding the butter, continue mixing on low speed until the butter has been broken down into small pieces and the mixture resembles wet sand (shouldn’t take much longer than a minute or two). Transfer 1 1/4 cups of this crust mixture to another bowl and set aside. Dump the remaining crust mixture into the prepared pan and press into an even layer over the bottom of the pan. (This could be a good job for a kiddo). Bake for about 15 minutes, or until the edges of the crust turn golden brown and it is set. Add the oats and brown sugar to the bowl with the reserved crust mixture. Stir to combine. Add the remaining two tablespoons of butter to the bowl and use your fingers (or a pastry cutter) to work the butter into the dry ingredients until combined. 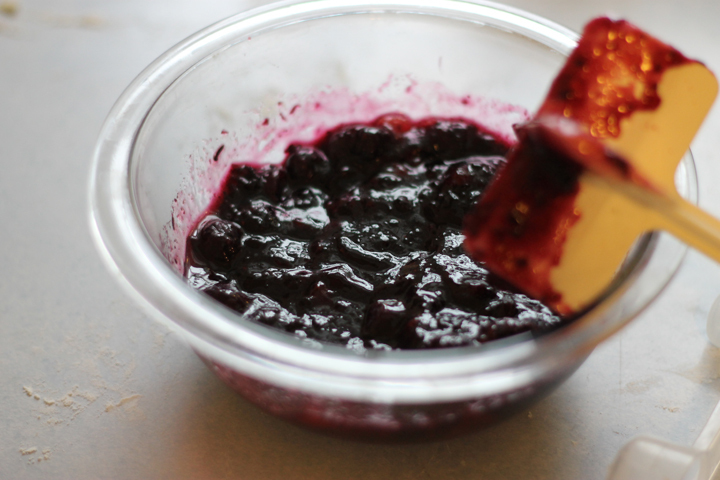 Make the filling by combining the blueberry preserves (or jam :), fresh blueberries and lemon juice in a bowl. Mash the blueberries – you want to break them down some, but still leave some chunks resembling berries. When you remove the crust from the oven, add the filling directly on top of the hot crust. Spread in an even layer. Sprinkle the streusel topping over the filling. I grabbed a handful and kind of “tickled it” on top of the filling. Don’t press the streusel into the filling! 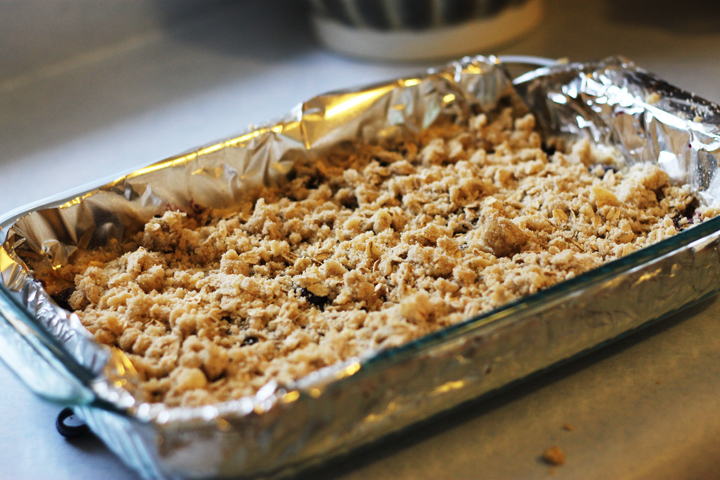 Bake for about 20-25 minutes, or until the filling is bubbling and the streusel has browned. Remove the pan and let the bars cool to room temperature, about 1-2 hours. Use the foil handles to lift the bars from the pan and cut into squares for serving. Store in an airtight container at room temperature. After cutting mine up, I moved some to a freezer bag and have them stored for future use. They freeze great and could be a great treat to take to a new mom or someone who needs a meal. 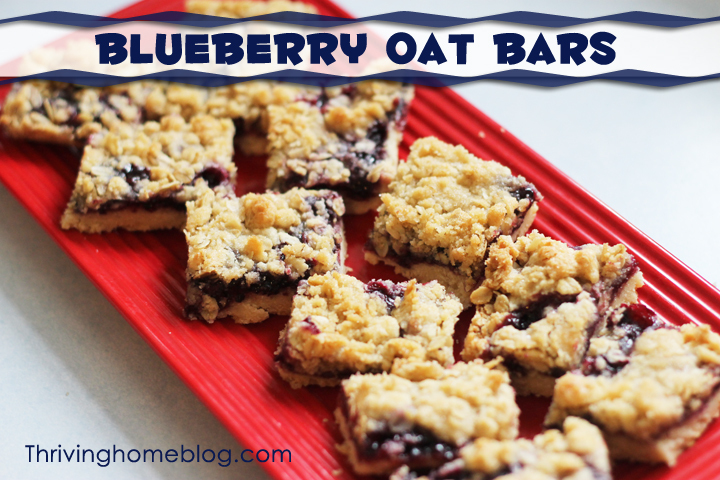 These blueberry oat bars have a buttery shortbread that cuts easily for sharing. 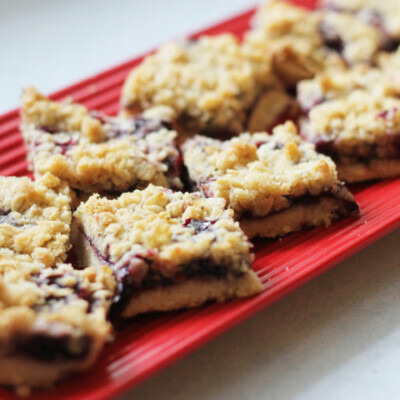 On top of the shortbread is a sweet, but not too sweet, blueberry filling topped with an oats crumble topping. Dump the remaining crust mixture into the prepared pan and press into an even layer over the bottom of the pan. 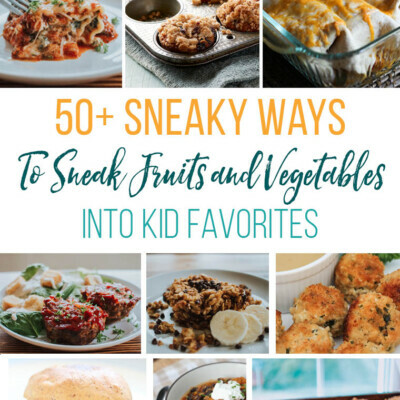 (This could be a good job for a kiddo to help with). Bake bars according to recipe directions. Let cool completely. Once cool, cut bars apart. Store in freezer safe bag or container for up to 3 months. 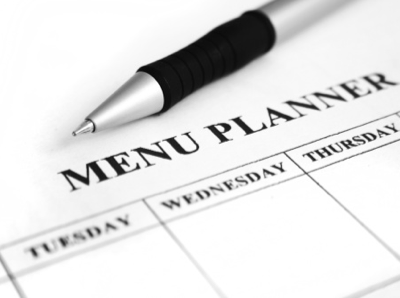 Remove desired number of bars. Thaw overnight in the refrigerator or warm in the microwave.